HOLIDAY BAKING FAVOURITES THAT EVERYONE WILL LOVE ARE A MUST FOR ANY PARTY. Chocolate Peanut Butter Balls have been a tradition in Mrs.CBB’s family ever since she was a little girl. 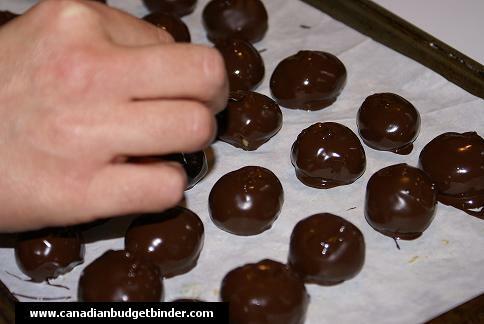 She would help her grandmother make these peanut butter balls covered in chocolate, so delicate for the Christmas Holidays. 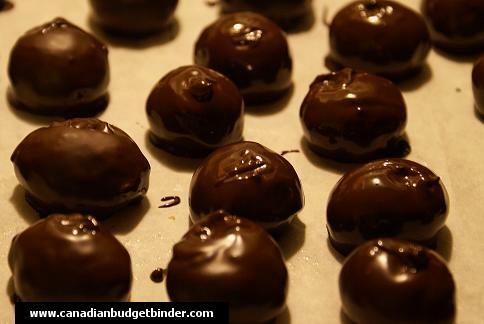 When her granny no longer could make this recipe for peanut butter balls she passed it down to Mrs.CBB who has made them ever since. Now we have made them together ever since we’ve been married. We have made a few changes to granny’s recipe by adding in some green cherries and vanilla although it really is a no fail recipe. 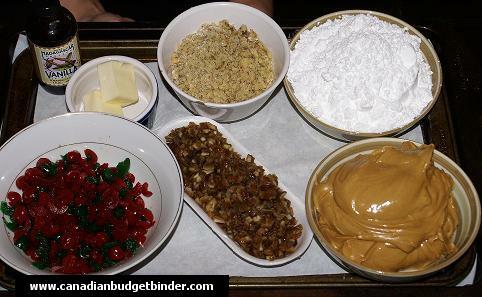 The great thing about peanut butter balls recipes are that they are a no-bake recipe and budget friendly. So if you don’t happen to have an oven to bake and wanted or needed to bring a Homemade Christmas Treat to a party you could easily make these on the stove top. I warn you it can get a bit messy when melting chocolate for dipping the Peanut Butter Balls sometimes called buckeye balls candy. Alternatively you can switch the recipe up and instead of peanut butter balls dipped in chocolate you could make white chocolate covered peanut butter balls instead. You could do both and they would look lovely on a tray together or gift wrapped for your mates. 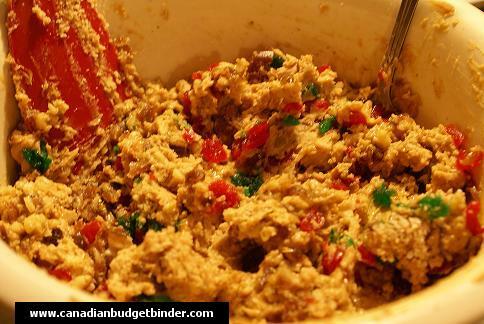 Well I didn’t make the peanut butter for this recipe although it is getting costly in some shops but still affordable. I remember when it $1.99 for a huge jar now it can run upwards of $4.99 or $3.99 on sale. Considering the price to make these homemade are far cheaper than if you buy them from the shop. 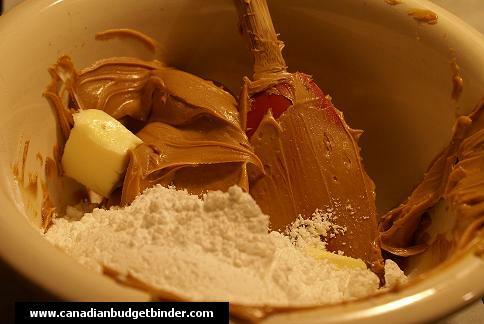 If you wanted to make your own peanut butter because you don’t want to invest in a container you could easily buy what you need at the bulk store or make it yourself. It’s an easy inexpensive recipe to make and much healthier. We already had some jars on hand from a food study we did so we decided to use them up. Buy the amount of roasted peanuts that you need and put them in a food processor with some peanut oil or vegetable oil, salt, and sugar and whiz away. It’s that easy. I stumbled across this amazing guide on “How To Make The Perfect Peanut Butter” that I’m sure you’ll love and find interesting. In our peanut butter balls recipe we have red and green cherries, walnuts, pure vanilla, chopped fresh dates,peanut butter,butter and icing sugar. That’s it, not too many ingredients. To dip the chocolate peanut butter balls we used a fork and toothpicks and about 2 boxes of semi-sweet bakers chocolate or we have used 2 bags of Hershey milk chocolate or semi-sweet chocolate chips. It’s up to you what you like chocolate wise. We were fortunate to find the bakers semi-sweet chocolate at Dollarama in 2 different cities for only $2 compared to $3.99 and up at the shops. 1 cup chopped walnuts ( make these small so bang about if you have to in a plastic zip bag)- great way to get frustrations out.. beat your nuts! Chop all of your ingredients that need to be chopped small and have them ready in bowls. Following completion of the recipe we take the bowl of raw ingredients and pop them into the refrigerator for about an hour to harden the mix up a bit. It makes it easier to work with the batter when it’ s cold. 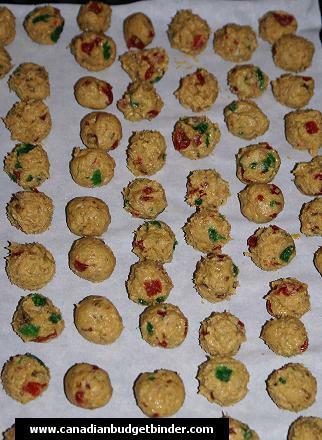 Take the bowl out and on parchment lined baking sheets start rolling small-medium sized balls uniform in shape. Don’t make them too big as they are meant to be bite size or two-bite peanut butter balls. After you have the balls rolled and on the tray put the tray into a freezer to freeze for about 1 hour. I know seems like a lot of hours to make these and it is but it’s super easy to make and worth the effort. Upon frozen you are ready to dip. We take a few out of the freezer at a time so they are still frozen when we dip as it yields the best results for us. Drop one into the melted chocolate which you melt in a double boiler or in our case a metal bowl over a pot of boiling water. 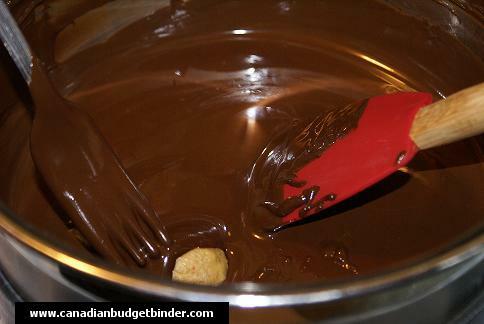 Lower the heat once the chocolate is melted and you can stream it off your spatula. You don’t want to get any water or steam into your chocolate or you risk it seizing up. Drop your peanut butter ball inside the chocolate and with your fork gently pick it up (don’t stick the fork in the peanut butter ball) have the ball sit on the fork. 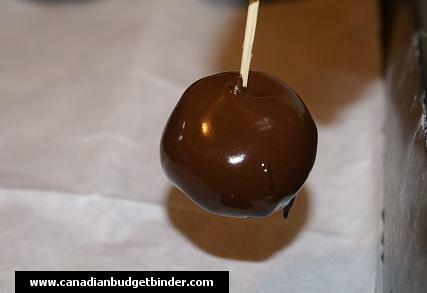 Stick the toothpick into the top and once the toothpick is secure you can twist the peanut butter ball off with your fingers from side to side on the baking tray lined with parchment paper. If you are thinking this is a tedious job it is, but again, worth it as you just can’t buy homemade like this. Once dipped and back on the parchment paper we use a toothpick dipped in chocolate to fill in any gaps that we may have missed and the hole where the toothpick was. We freeze the peanut butter balls for about 2 hours or until solid. Take your balls out about 1 hour before serving to bring them to room temperature although we are known to pop them in our mouth straight out of the freezer. That’s all my friends! 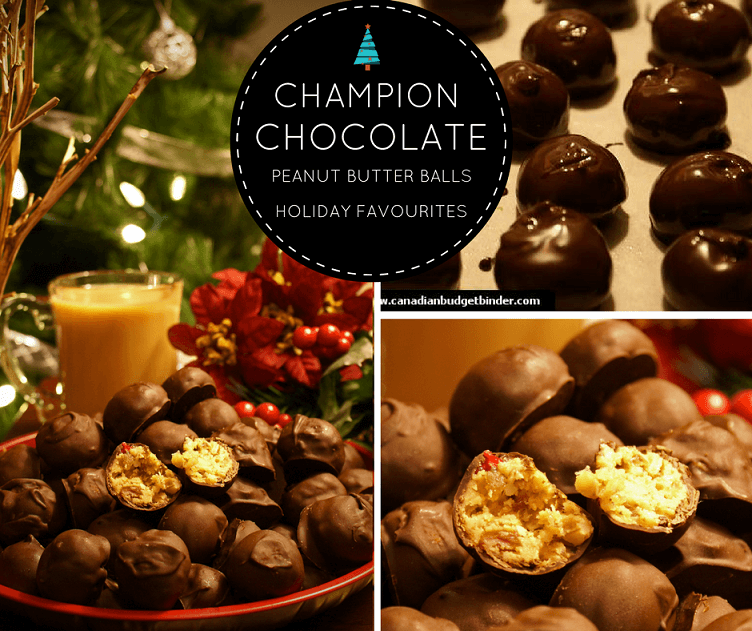 I hope you give our Chocolate Peanut Butter Balls a try and let me know what you think. Next week we move on to Coconut Balls. What are some of your favourite holiday treats? I know … it is really good!! Thanks for droping by Collen! Yum they look so delicious! 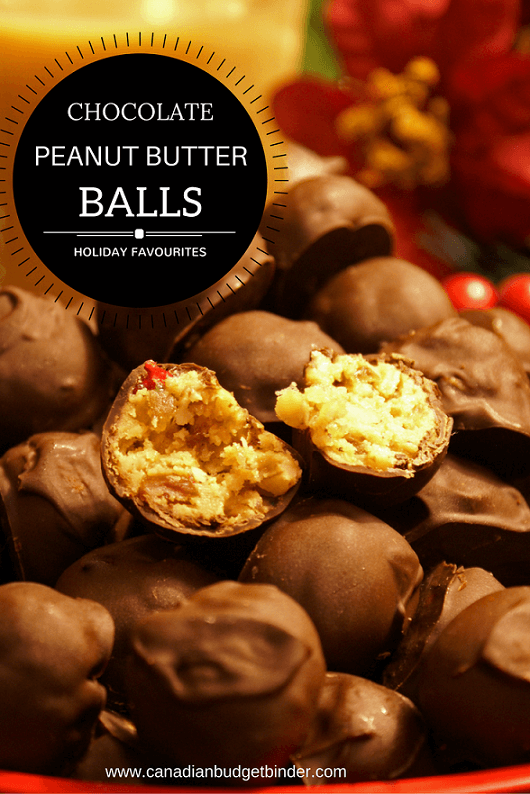 I love balls….er I mean peanut butter chocolate balls. lol!! No seriously, my favorite combination!! Now that’s a true holiday treat! Love this recipe, CBB! Can’t wait for the coconut balls. The coconut balls are just as yummy.. that will be up this Sunday but I’ll have the picture up on Facebook any day! Cheers Amy ! I bet you like to beat your nuts! lol. I’m TOTALLY going to make these CBB (although I’m going to skip out on the dates and may eliminate the walnuts). Where can I find the maraschino cherries? Are they in cans or in the produce section? they are in the baking ing section.. sugar.. etc… in jars. Yes you can eliiminate the dates, add more cherries or use pecans if you like… they are pretty much hard to muck up… haha.. let me know how it goes. I would not have guessed to put cherries, but they make them really pretty. I think I’d have to leave out the dates. I’m not even sure they sell those here, but I’ve never looked. Eeee! Those look scrumptious. I’ve died and gone to heaven. This is something I might try as everyone else here likes peanut butter but me. We have the peanut butter but the trick will having them last long enough to coat with chocolate. We have 2 legged rats here…..
Oh they will want to wait they are so good coated Christine. Go for it, they’re great! Okay: for THIS I go off my diet! This one is going on the top of my list. I love anything with peanut butter. Thanks for the recipe Mr. CBB! I would have thought making peanut butter was going to be more expensive than buying, but healthier. Nuts are so expensive those days. Good to know it is so easy to make. Thanks for sharing! They look delicious! I’m definitely going to be trying this recipe before Christmas! thanks for sharing this recipe I’m going to try to make it with dark chocolate so that my brother in law can eat them, being unable to eat dairy he gets the short end of the stick at holidays. Thanks for sharing a family heirloom recipe…and please thank Mrs CBB!